The Yurt originates from central Asia and is used by the regions nomadic tribes. Yurts are a beautiful structure, snug ,cosy and promoting a nice sociable vibe with their circular shape. No poles, No pegs, No ropes. 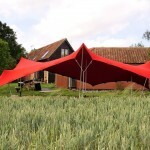 With Yurts there are no obstructions caused by more traditional tents which have pegs and ropes around the outside. Musicians like their acoustics and they are great for chilling out in. They are a beautiful and practical space. The structure itself is decorative and it can be added to with other decor and drapes. The yurts are hardy and cope with wet weather. They are very cosy even in winter with droughts finding it hard to make a way in, and with the addition of a heater they can be kept toasty. 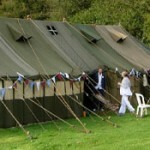 More information on the history of this type of tent. 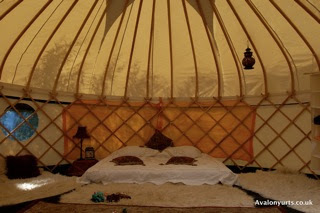 Yurts can be made very cosy and comfortable. Ideal as a living space. There is standing room for 10-40 depending on size. 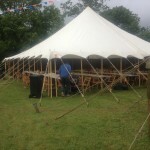 The yurt needs to be erected on level ground. 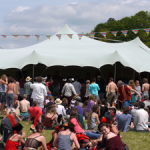 Yurts are regularly used to hold workshops and as classrooms. 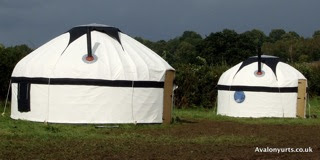 Click here for yurt hire cost or email us to request an event quote.